Congham is a small thin parish running east-west in northwest Norfolk. It is north of Grimston and south of Hillington. The modern village lies at the foot of the chalk scarp and in the medieval period the settlement here had three churches. Congham Hall, now a hotel, is located a short distance to the south of the village. The Domesday Book records the village as having only a single church but also a fishery and a salthouse. It was part of the lands of William de Warenne. The origin of the village name has been disputed but is thought to be Old English for ‘village at the hill’, or ‘village at the bend’. Fieldwalking, excavation and metal detecting have led to a clearer understanding of the changing settlement pattern in the parish. The earliest prehistoric finds are two Palaeolithic flint axeheads (NHER 13058 and 15632). There are also finds of later Mesolithic flints including a possible Mesolithic macehead (NHER 3556) and Neolithic flints (NHER 11816). Activity intensifies in the Bronze Age. Three Bronze Age barrows (NHER 3558, 11678 and 12792) are found widely spread to the west of the parish, perhaps positioned beside or close to the Icknield Way (NHER 1398) a possible prehistoric track. Several Bronze Age socketed axes (NHER 3559, 16992 and 30690) and a Bronze Age awl (NHER 30690) have also been recovered. There is extensive evidence for Iron Age activity, mostly located just to the west of the modern village. Here Iron Age pottery (NHER 3536, 3566, 11816, 12539 and 13059), Iron Age brooches (NHER 11816, 14392 and 25765), an Iron Age mount (NHER 25765) and Iron Age gold and silver coins (NHER 20853, 25765 and 30690) are all concentrated at what is probably an Iron Age settlement site (NHER 11816). 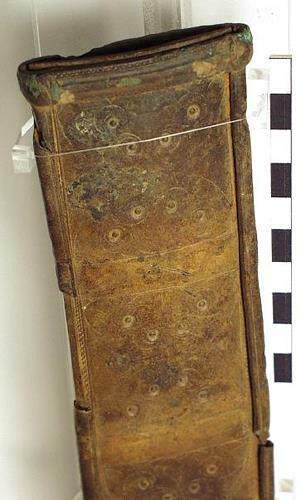 The discovery of an ornate decorated Iron Age copper alloy scabbard (NHER 20426 and 20427) is also part of this intense activity during this period. This activity continues into the Roman period. A Roman building (NHER 3560), probably a villa, was excavated to the west of the village in the 1960s. This is located besides a small spring and is surrounded by evidence of further occupation and possible industrial features. Finds of Roman coins (NHER 3561, 20410 and 20853), Roman brooches (NHER 22006, 34438 and 3565) and Roman pottery (NHER 3562, 3566 and 11743) indicate the settlement was quite extensive, strung along the line of the Icknield Way. A Roman ‘mini’ chisel (NHER 23708) may also indicate the presence of votive activity on the site. 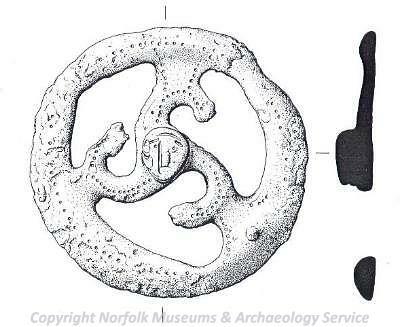 Finds of Early Saxon date include a large number of Early Saxon brooches (NHER 11633, 20975 and 30652) indicative of an Early Saxon cemetery involving inhumation and cremation. 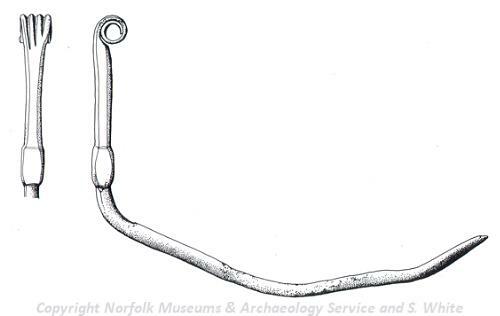 Finds of Middle Saxon pottery (NHER 13059, 16778 and 22210) and Middle Saxon metal work (NHER 3562, 3565 and 3566) and excavations of a Middle Saxon building (NHER 3565) in the 1960s have revealed the presence of a Middle Saxon settlement strung a kilometre along the Icknield Way running north-northwest to south-southeast. The site of Late Saxon All Saints' church (NHER 3562) is at the western edge of this scatter. This is probably the church mentioned in the Domesday Book. Two other churches date to the medieval period. St Andrew’s church (NHER 3606) is a 13th century building located in the middle of the modern village whereas St Mary’s church (NHER 19347 or 14436) has been lost since the medieval period and its exact location is no longer clear. There is medieval settlement in the area and earthworks of medieval house platforms (NHER 11743 and 16778) can be seen from aerial photographs. Excavation in a garden in modern Congham recovered lots of pottery waste that shows there was a medieval pottery-working site (NHER 29742) nearby. Iron smelting waste from the same site may also be medieval. Reed Hall, a possible medieval moated manor (NHER 3570), is recorded in 1724 and was located to the north of the Middle Saxon settlement scatter. Congham Hall (NHER 3605) was built between 1794 and 1812 to the south of the modern village. The park (NHER 31969) was formalised in the 19th century. Congham House (NHER 3604) was built in 1858 for Robert Elwes the painter, but has since burnt down. A post medieval windmill (NHER 14998) is recorded in Congham on Faden’s map of 1797. There is extensive archaeological evidence in the parish for long-term occupation. This is concentrated on the edge of the chalk scarp and around the Icknield Way. The permanent Roman, Early Saxon and Middle Saxon settlements here were probably centres of trade that grew as a result of the excellent communication afforded by the presence of the Icknield Way. Less is known about the later medieval and post medieval periods in the parish, but this may be due to a lack of synthesis and recording rather than a lack of evidence. Pestell, T., 2003. 'The Afterlife of 'Productive' Sites in East Anglia' in Pestell, T. and Ulmschneider, K. (eds.) Markets in Early Medieval Europe. Trading and Productive Sites, 650-850. (Macclesfield, Windgather Press) pp. 122-138.